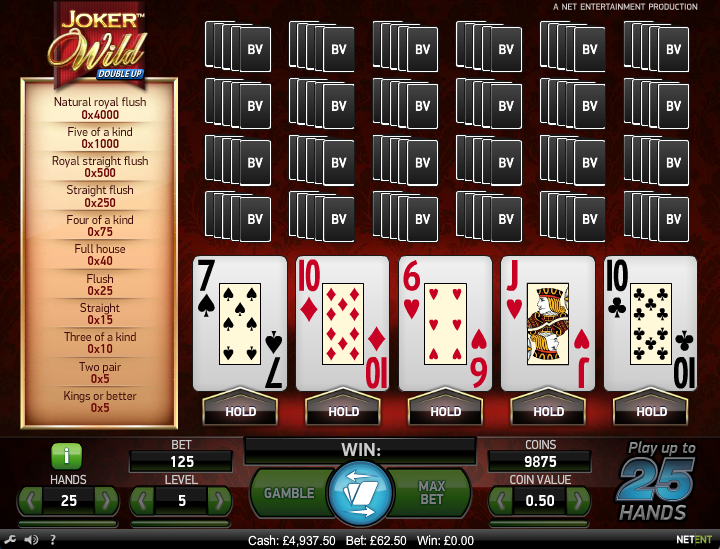 Let’s take a dip into the world of video poker for a few minutes to check out this variation on a familiar theme. It’s called Joker Wild Double Up and it’s from Net Entertainment. 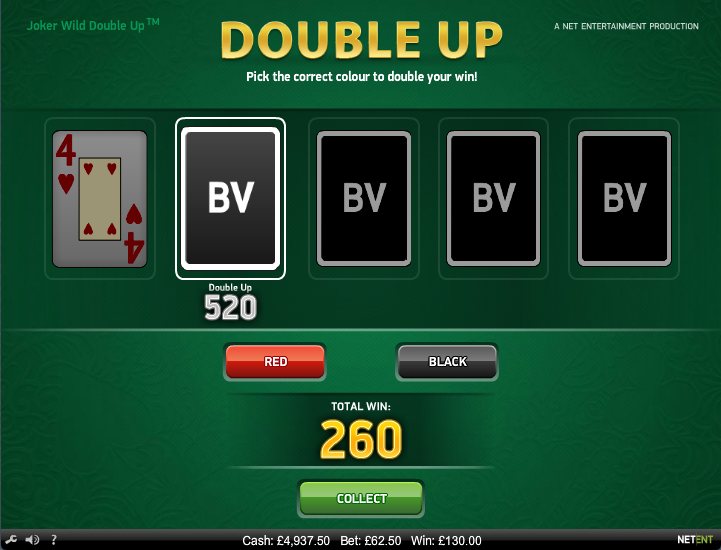 You may guess from the title that it involves a joker to add a bit of spice to the mix and the ‘double up’ refers to the opportunity to gamble your wins. The layout will be familiar to anyone who’s dabbled in video poker previously – all the game controls are at the bottom of the screen with your initial five cards just above. A paytable occupies the space above the cards and to the left there’s a list of all wins from the current hand. This is a multihand game which means you can play with 1, 5, 10 or 25 hands simultaneously. Select your bet level to begin with by using the ‘Level’ and ‘Coin Value’ selectors to choose between a range of £0.10 to £62.50. Now select the number hands you wish to play with the ‘Hands’ button. Get thing started by clicking the big green button at the bottom to reveal your first five cards. You now have the chance to ‘Hold’ any or all of these cards in the hope or replacing them with cards that will help you create a winning hand in the next deal. Click the green button again for the second and final deal. When you’re choosing which cards to hold bear in mind that the minimum to win is a pair of Kings (standard video poker pays out with a pair of anything). This is offset by the inclusion of a single joker in the pack which obviously substitutes to make the highest possible hand. The RTP for this game is certainly lower than a similar game such as Jacks or Better; there you can bank on a theoretical return of between 98.40% – 99.56%. The slight differences in this game mean a return of 97.07% – 97.95%. If you’re playing in the hope of profit, stick with Jacks Or Better.